Similar to the widely popular original Star Peeler, this vegetable peeler features an identical design, so it offers the same ergonomics and comfort level. The main difference is in the blade. This one has a stainless steel blade, so it won't be quite as sharp, but it will be far more convenient for those that prefer not to hand wash or take special effort to dry the blade. The original Star Peeler will definitely offer better performance overall due to it's hardened steel blade, but that metal can rust over time, if not treated properly. This fruit and veggie peeler gives up a bit in the sharpness category in order to be 100% dishwasher safe for effortless clean-up after the work is done. This means that you can throw it in the machine just like your forks and spoons, and not have to worry about it later. The stainless steel blade and body will remain rust-free for years of operation, allowing you to easily skin fruits, peel vegetables, and create decorations and garnishes. 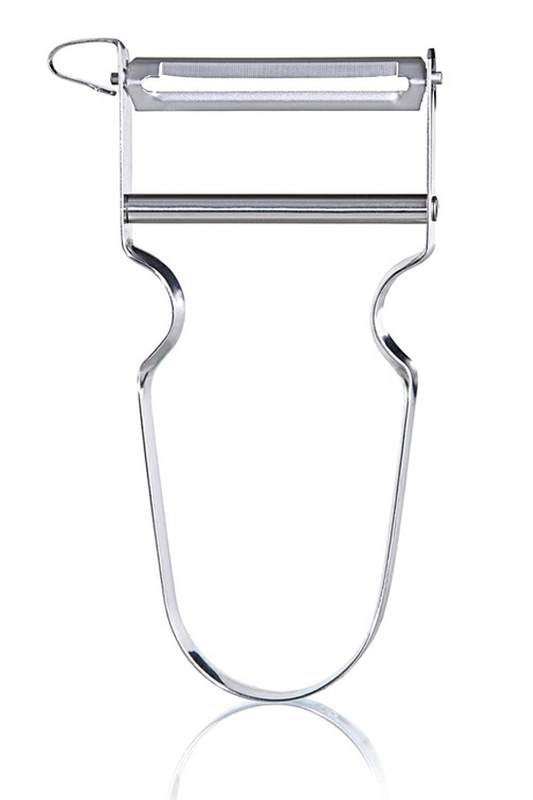 This Swiss-made stainless steel vegetable peeler features a standard straight blade, and is an indispensable tool to have in your kitchen. On the side there is also an integrated cutter for removing potato eyes and imperfections, and it can even be used to easily carve decorative grooves into fruits and vegetables, or cut thin strips for use in salads. The shape of this tool allows for easy use by those with arthritis or strength problems because you are able to keep a wide, comfortable grip. This same design also allows it to be used by both left and right handed people with the same professional style results. Sturdy materials and Swiss-Made construction will ensure a long life for this tool, and the stainless steel blade will deliver the peeling power and convenience necessary to make this the peeler of choice in your kitchen. This tool only needs slight pressure to produce great results. To use it, simply press down gently against the fruit or vegetable and then run the peeler along it in either direction. You can peel away from yourself or towards, and it will work just as well. Right away you will notice how comfortable it is to hold, how effortlessly it removes the skin, and how quickly you will complete the task. If you do apply more pressure, you can do more than just peel because increased pressure will generate thicker slices. To use the cutter on the side, simply hold it sideways and use the loop to cut in and remove any part of the food you wish. Press against a carrot lightly with this part, and then run down to peel off julienne style strips that can be used to garnish or add to salads. Once finished, hand wash or place in the dishwasher. Hard, soft, slick, fuzzy, this tool will work on them all. Use it for carrots, apples, potatoes, cucumbers and so much more. With such a great design, this high quality peeling tool will offer an easy to use solution that is convenient enough for any home chef. If you're looking for the ultimate in sharpness for your peeling, then the Original Star Vegetable Peeler will be more your style. The blade requires a bit of periodic maintenance, but it will be sharper, and stay sharp longer. For a more economic choice, check out the original version called the REX Peeler. It has the hardened steel blade, but the handle is made from aluminum instead of steel. If you like the stainless steel blade, and also want some other types of peeling tools, check out the Star Trilogy Set. It includes three different tools. You will get the one featured on this page along with a Julienne Peeler, and a Serrated Peeler. Order Yours Today! 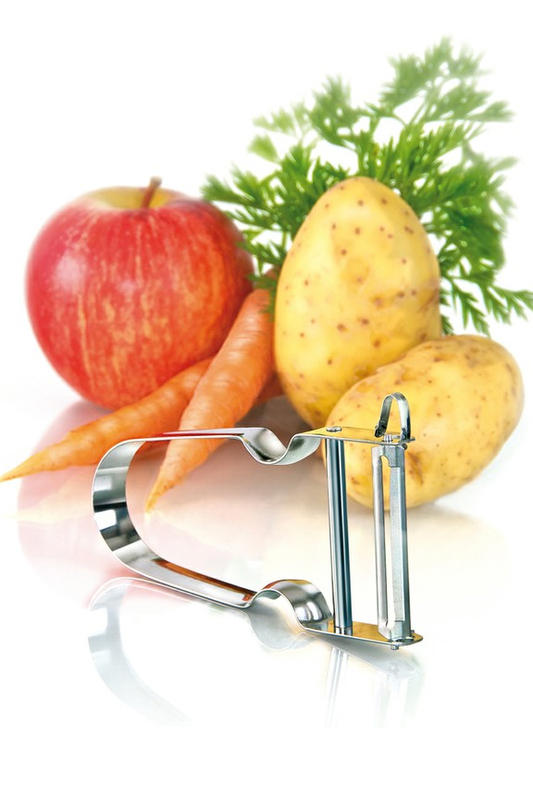 Star Stainless Steel Peeler - High quality Swiss-made peeler. Stainless steel blade adds convenience. Great for left handed people or those with arthritis. Order Yours Today! This is the best grater I have ever used. The blade allows for effortless grating. I plan to purchase more for gifts. I had bought one of these amazing peelers about 15 years ago at a street festival. Its the best tool I have ever had. Somehow, I lost it and looked all over to replace it. Finally I found it on the net. I ordered 2 to make sure I always have one available. My Mama has had one of the Steel Star Peelers for many many years! It has peeled many tons of potatoes, carrots, etc. but has never dulled! It is the most amazing kitchen tool I have ever seen. I never thought I would be able to replace it, not that I need to, but just in case. I typed in Star Peeler, which I was stamped on the peeler. To my amazement, there it was! My Mama is now in Heaven but she left me the greatest little tool filled with memories from all the years of her cooking and working in the kitchen. 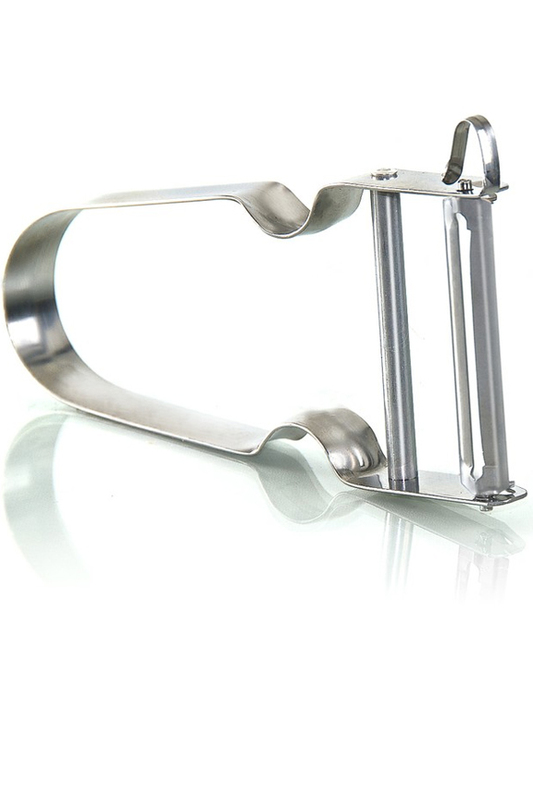 Of course I ordered 2 for just in case and also to give to my son....but I am sure that Mama's Star peeler will still be as sharp as the day she bought it when he has his turn at it! Thank you for such a sesational product that never quits cutting!! I have had one of these before. Just saw it in magazine and ordered more. Great little tool. Works great. Bought for my daughter and daughter in law!!! This is the most awesome peeler! It is the only kind that makes it so very easy to peel anything! I ordered these for a friend to whom we had given one. She liked it so well she wanted a second and more to give to her friends and family. All who use them are impressed! Best peeler ever. This is the best peeler I have ever used. well I am using my new peelers...and they work well. I had one before, but somehow got wrapped up with peelings. Was so happy to learn where to get another. I absolutely love it. Love my peelers. They are so sharp and work better than any other peeler I've ever had. Never used a better peeler and never will. This is the best peeler! Takes seconds for a potato. I had bought a peeler like this several years ago and it has remained very sharp. My grandson who is 8 years old peeled potatoes with ease using this peeler. He likes the way the handle is made. I got the stainless steel and the regular star peeler, just to try both. So far, I have peeled some cucumbers and it works very smoothly. I will be trying potatoes and other veggies soon. I bent my last peeler on a sweet potato, so I will probably avoid those forever. Seems like a solid peeler at a great price. When I ordered they were on back-order, so don't be surprised if it takes some time to arrive. This is the absolute best potato peeler I have ever used. I have ordered them for all my daughters and they love them also. The stainless steel star peeler is the most terrific kitchen item I have ever had. I will be ordering more to pass out to my friends. Very pleased, also, with your service. Excellent. I have had these in the past and love them. I am giving these as Christmas gifts! And I simply love the one I use. It is the best peeler I have ever had. I have been using this peeler for years and they work great. I love this peeler, this is my second one, I wore out the first. It is sharp and peels easy. I hand grip is comfortable in your hand. Love it. I also like when people do reviews because it does help me decide if the product is worth it.